A blend of Merlot, Cabernet Sauvignon and Carménère (typically 85%, 14% and 1% respectively) from biodynamically and organically farmed 50-year-old vines. The grapes are fully destemmed. Fermentation in open, temperature-controlled vats with indigenous yeasts and no chaptalization lasts two to four weeks. Matured 14 months in large foudres and 11 months in third- to fifth-fill oak casks. Bottled unfiltered with only a small dose of sulphur. Reducing sugar: 1.9 g/l. 12.5% ABV. A few 500 ml bottles of the 2012 can also be found ($20.75, 00896399). Quebec agent: A.O.C. Founded in the late 2000s, the tiny (1.5 hectare) estate makes a Sauternes and a red Graves. The latter is a blend of Merlot (around 50%), Cabernet Franc and Cabernet Sauvignon from organically farmed vines averaging 40 years old and rooted in gravelly soil over a clayey-calcareous base. Manually harvested. The varieties are vinified separately. The Merlot is cold-macerated before fermentation for a week, the Cabernets are directly fermented. Fermentation at low temperatures with indigenous yeasts, punch-downs and pour-overs (using buckets, not pumps) lasts 10 days. The wine is then left on it skins for another eight to 10 days. 12.5% ABV. 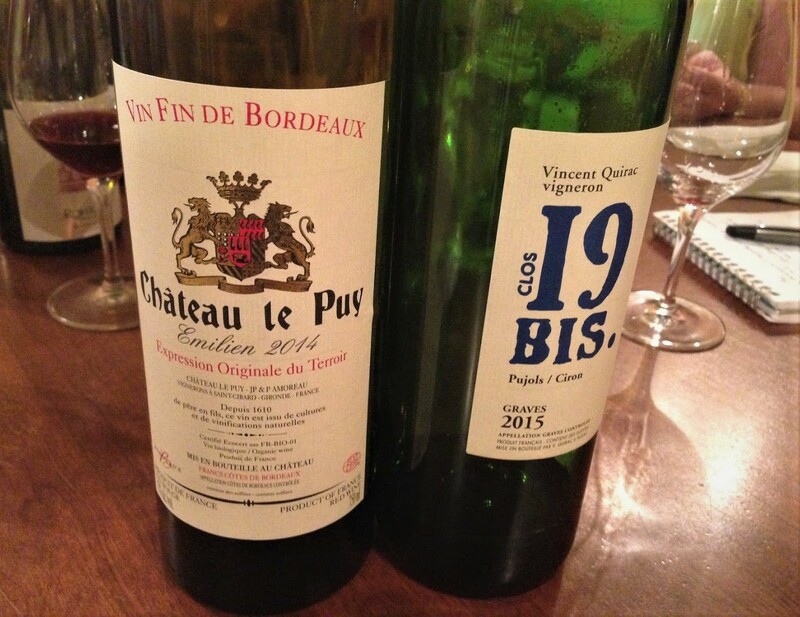 Quebec agent: Vini-Vins. 100% biodynamically and organically farmed Poulsard from a single vineyard planted nearly 40 years ago. Manually harvested. Destemmed. Maceration and fermentation, with indigenous yeasts and daily pump-overs, take place in tanks. Matured in 50-hl oak barrels for eight or nine months. Lightly filtered before bottling. 12% ABV. Quebec agent: Raisonnance. 100% Trousseau from vines planted in the one-hectare Grevillière lieu-dit in the 1950s. Manually harvested. 100% destemmed. The lightly crushed grapes are cold-macerated then fermented with indigenous yeasts for around 18 days. Matured in large oak barrels for 18 months. Lightly filtered before bottling. Reducing sugar: 1.7 g/l. 13% ABV. Quebec agent: Symbiose. 100% organically farmed Poulsard from several different parcels in Montigny and Arbois. Manually harvested. Fermented in vats with indigenous yeasts for 15 to 20 days, then racked into neutral foudres for malolactic fermentation. Matured in barrels for around two years. Unfiltered and unfined. 12.5% ABV. Quebec agent: Vini-Vins. 100% Cortese grown in the southern Piedmont commune of Gavi, making it a Gavi di Gavi. Pressed, clarified by settling, then fermented at low temperature. 12.5% ABV. 100% biodynamically farmed Cortese grown in the Tassarolo commune neighbouring Gavi. Manually harvested. Fermented and matured in vats and barrels made from either acacia or oak (the estate’s website contradicts itself). No added sulphur. Lightly filtered prior to bottling in September of the year following harvest. 12.5% ABV. Sciacarello (70%) blended with Nielluccio from biodynamically farmed 10- to 15-year-old vines. Macerated 40 days, fermented with ambient yeasts, aged in concrete vats. Around 20,000 bottles are made per vintage. 13% ABV. Maquis with cedary overtones; sun-baked earth and stones; dried red berries. Medium-bodied. Muted and dried herby on the attack, followed by a light wave of not very sweet fruit (morello cherry? ), tingly acidity and fine, astringent tannins that persist through the long, mineral and leaf-scented finish (tobacco? herbs?). Very dry and austere, yet seductive. Very close to the earth, yet noble. About three hours after carafing, it had sweetened and smoothed though lost none of its savour. Final thoughts: Burgundy-like weight, Chianti-like structure, flavour profile all its own. Drink slightly chilled. Last I checked – a couple of weeks ago – this was still available (Vini-Vins’s website is little more than a placeholder, having been en construction for months, and they don’t have a mailing list). The price is approximate because I didn’t pay for the case and so haven’t seen the final bill. Oddly, about the same time, friends who had spent part of the previous summer vacationing on the Île de beauté, invited me over for dinner. Two beautiful dry whites were served double-blind and I was instructed to identify their provenance. The texture and flavours pointed to the Mediterranean, the maquis on the nose suggested Corsica. Bingo: Abbatucci’s high-end cuvées, the best Corsicans they had encountered during their two visits to the island. As it turns out, both are also carried by Vini-Vins. All of which is to say: this is an exceptional estate that makes outstanding wines and we’re fortunate to have access to them. Having arrived from Burgundy in the Middle Ages, Chardonnay (also known locally as Melon d’Arbois and Gamay Blanc) is the now most widely planted grape variety in the Jura, occupying nearly half the vineyard. It’s made in a range of styles, from light to rich and from fresh to oxidized. The increasing popularity of Chardonnay-based crémants, which can be successfully made from underripe grapes, has had the effect of improving the quality of the region’s still Chardonnays in recent years. Founded in 1997 by Stéphane and Bénédicte Tissot, this négociant firm is named after the magnificent, gothic-arched cellar in which its wines are stored. The wines have become more accomplished over the years. Jean-Michel and Laurence Petit created this estate in 1990. Their wines, especially their whites, are notable for their vibrant fruitiness, somewhat in the mould of Stéphane Tissot’s. Prices are reasonable across the board. Poulsard and Trousseau are the Jura’s traditional red (some would say dark pink) varieties, though Pinot Noir has been gaining ground in recent years. Poulsard wines are traditionally paired with the local charcuterie and smoked meats, Trousseau wines with game. Founded in the 1940s, Rolet is one of the largest producers of Jura wine, second only to Henri Maire. Makes wines from every appellation except Château Chalon, and the quality is high across the board. One of the trail-blazing producers of mono-varietals, Rolet continues to focus primarily on single-grape-variety wines. Jean-François Bourdy refers to this as his PPT (Poulsard, Pinot, Trousseau). The wine is matured three to four years in old oak barrels before bottling. The estate says good vintages can age up to 50 or 60 years; seeing as how they were pouring a still-vibrant wines from the ’50s and ’60s (the SAQ Signature outlets are currently stocking the 1964) at various Jura events a few weeks ago, it’s not an empty claim. Jean-François also suggests carafing the wine for two or three hours before serving, advice our bottle indicated you should follow. My latest information, which dates from a couple of years ago, is that Domaine Labet is a practionner of lutte raisonnée. Aside from an early spring herbicide and moderate sulphuring post-fermentation, extraneous chemicals are avoided. Though still connected with the eponymous family domaine, Julien also makes wines under his own name. As befits his age and rocker reputation, he’s more open to experimenting. He’s been farming organically for a while and is in the process of obtaining official certification. Puffeney is one of the Jura’s legendary winemakers and one of the handful who are equally accomplished with reds and whites. A traditionalist in the best sense of the term, he farms organically and uses only ambient yeasts. This forward-looking estate is now run by André and Mireille’s son, the affable Stéphane. The house style tends toward modern, vibrant, more fruit-driven wines, albeit ones that sacrifice none of the their jurassien character. Organic since the late 1990s, biodynamic since the mid-naughts. Among the many attractions of SAT’s Foodlab is the short, constantly changing selection of natural wines, most of them available by the glass. (Among the few downsides of SAT’s Foodlab is the stemware: heavy and small, meaning the glasses are filled nearly to the brim and allow no room for the wine’s bouquet to develop.) We ordered four to accompany this week’s excellent Russian Easter menu, the high points of which were a clear borscht, a coulibiac of halibut and salmon and the dessert, a slice of dry, cardamom-perfumed cake and a slice of a pressed cheese obelisk garnished with candied fruit and almonds. 100% Aligoté from two Meursault parcels planted in 1929 and 1948. Initially muted (possibly the fault of the glasses). The nose’s white peach, quartz and hint of lemon are joined by green fruit (gooseberry?) in the mouth. Acid-bright but not sharp; indeed, it sits softly on the palate. Finishes on a faintly lactic, ashy, leafy note. Not profound but wonderfully drinkable. 100% biodynamically farmed Blauburgunder (aka Pinot Noir). Extroverted nose: berries, beet, cola, earth and smoke. Medium-bodied (13%) and intensely flavoured, the ripe fruit sharing the stage with spices, slate and dried wood. Fluid texture. Light, firm tannins turn astringent on the finish. A vibrant Pinot Noir, not at all Burgundian yet very true to the grape. A winner. 100% Romorantin from 40- to 90-year-old vines; 85% is aged ten months in demi-muids and barriques. Dry but lightly honeyed. Round, supple and fluid. Acid blossoms on the deliciously sourish finish. Minerals galore and a preserved lemon aftertaste. Pure, clean, long. A beauty. Hazy bronze to the eye. Wafting nose of honey-candied yellow fruit, spice and a whiff of musk (not knowing anything about the wine, I wrote “Malvasian,” so it’s true to type). Quite intense on the attack – fruity, grapey, semi-sweet – it downshifts radically on the mid-palate, fading and drying to rainwater and minerals with a hint of tannins. Intriguing. Located at 500 m high, the vineyard DENAVOLO, named after the mountain upper the cellar and the locality where the vineyard is planted, spreads over 3 hectares in the Colli Piacentini area. The vines are grown on limestone soil, the climate is hot and dry, but at this altitude, the temperature fluctuations between night and day are more than 10°C, explaining that freshness and minerality in the wines. We only use local grapes : 25% Malvasia di Aromatica Candia, 25% Ortrugo, 25% Marsanne grapes and another not identified yet. DINAVOLO and DINAVOLINO are produced as if they were red wines, the grapes are de-stemmed, crushed and then stay several months in skin maceration to release in the wine all the aromatic and phenolic components which are in the skin. The wines present a beautiful orange colour, a mineral and lightly flowerish nose, the mouth is well-structured with tannins and a good length. The main difference between both cuvée comes from the location of the grapes in the vineyard. To produce DINAVOLINO, I selected grapes only located in the downer part of the hill, those grapes keep more acidity and the wine produced is completely different, freshner, younger and more aromatic.